If you want to spend quality time with your small family, private time with your closest friends or intimate moments with your special someone accompanied by another pair, Villa Pulau may just be the ideal vacation residence. 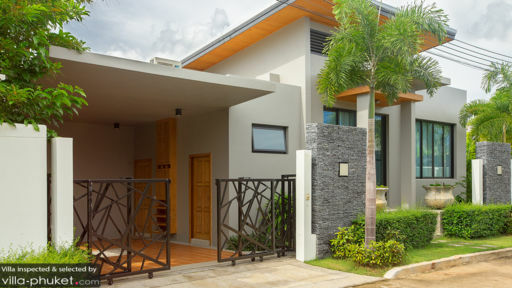 The villa’s modern amenities and luxurious appointments offers you an escape from everyday living without having to miss out on its comforts and conveniences. Compact and complete with just about everything you need for an enjoyable and relaxing stay, Villa Pulau is truly a perfect hideaway. The villa has two bedrooms. One has a king-sized bed and has direct access to the swimming pool. The other has twin beds and opens out to the garden. Both have dedicated bathrooms with a view of the garden through large windows. Bordered on one side by tall tropical plants, the eight-meter swimming pool covers the villa’s entire outdoor area. In its cool and soothing waters, you can just swim or wade unmindful of anything. 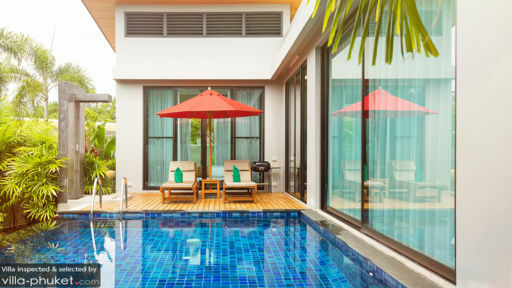 On the wooden deck, you can stretch out on the cushioned pool beds partially shaded by the large pool umbrella as you relax and simply forget all your cares. Indoors, the living area offers two ways for you to lounge about. One is on a round day bed where you can just crash comfortably. The other is on the long and large couch in front of a wide, flat-screen TV where you can all indulge in a marathon of your favorite series or movies. Around the corner is the dining area combined with the fully-equipped, ultra-modern kitchen. Here, all of you can have a festive time preparing meals for yourselves or concocting your culinary masterpieces to show off or for sharing with the rest. Services for the upkeep of the villa includes twice-a-week housekeeping as well as pool and garden maintenance. 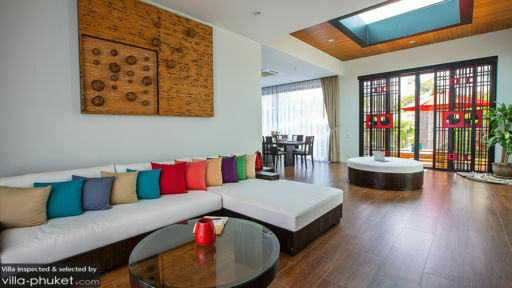 Villa Pulau is located in Nai Harn Beach – one of the most popular and relatively tranquil in Phuket. The beach becomes ideal for swimming come the months of November to April. Highly recommended dining places in the area include Maggie And Mario’s Pizza, Da Vinci, De Renata, Rum Jungle Cafe and Promthep Cape Restaurant. For snorkeling expeditions, head further south to the tiny beach of Ao Sane and to the sandy cove of Ya Nui. While you’re there, make your way to Windmill View Point to get a spectacular view of Nai Harn Beach. One other must-see attraction is the landmark Wat Nai Harn.